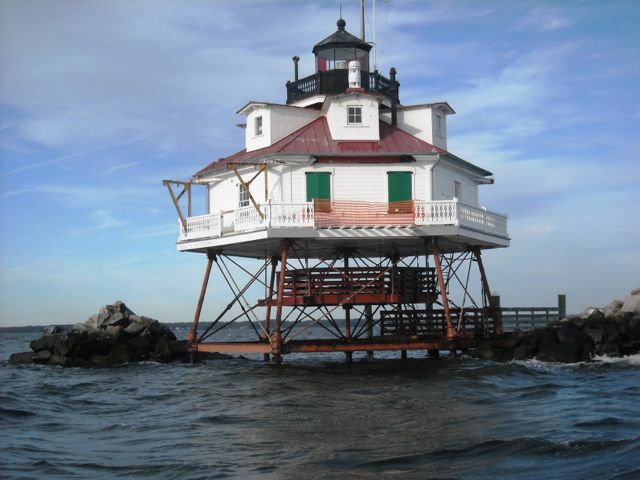 Workday: Thomas Point Lighthouse – Oct 20th and Nov 8th 2014 – Chesapeake Chapter U.S.L.H.S. Thomas Point with shed gone. On October 20th two volunteers headed out to do some more work at Thomas Point. They had a shortened workday due to the weather – but they still managed to accomplish quite a bit. 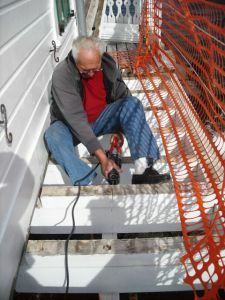 They finished removing the remnants of the storage shed and began installing deck boards where the raised platform in front of the shed used to be. On November 8th a small work crew went out on the last scheduled workday at Thomas Point for 2014. The day was clear and dry but the weather had started to turn and it was quite a chilly day to be on the water. 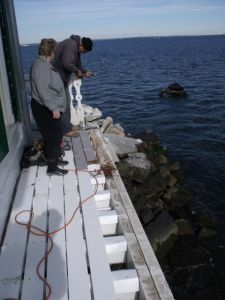 The crew delivered materials for the new railings that will go where the old Coast Guard shed stood. 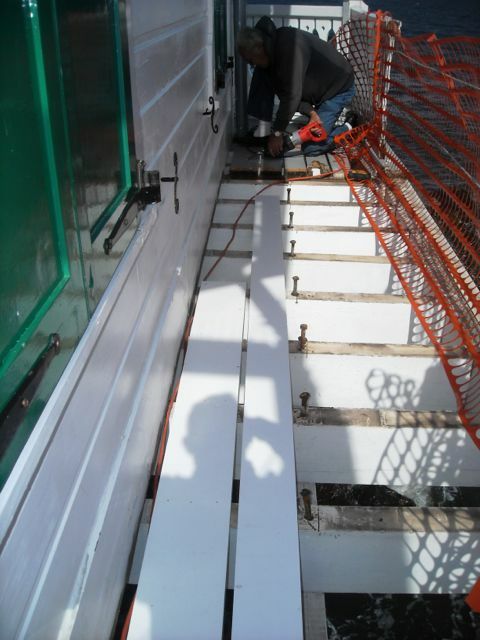 They delivered new posts, some wooden top rails and aluminum poles that will serve as part of the railings. They removed two old exterior railing posts that remained from where the old storage shed was located. They added aluminum flashing to a few floor joists, installed three new railing posts and added an aluminum rail to the top. 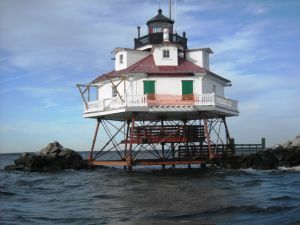 It resembles the railing out at Drum Point Lighthouse at the Calvert Marine Museum. 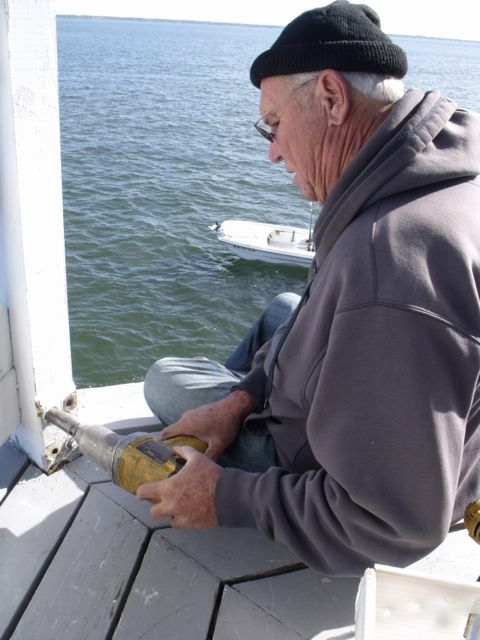 Volunteers also removed some of the old pickets and secured several others. There were some interior tasks as well. They added some molding to the kitchen pantry, some baseboard to the sitting room floor, and installed quarter-round molding to one wall. 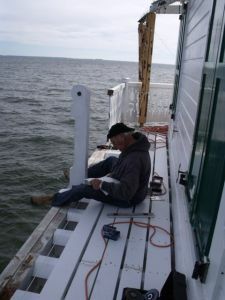 They also gave the interior ceiling of the lantern room another coat of white Rust-o-leum and scraped and painted the interior top glass frame of the lantern room. 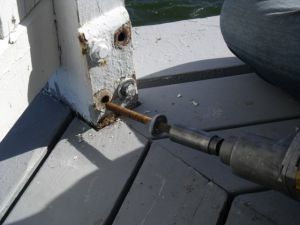 They also did some additional scraping of the light pedestal. 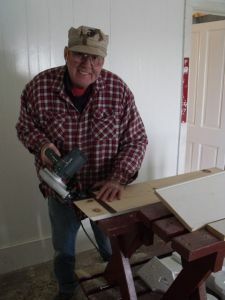 Then before they left they swept the floors to clean up the sawdust and lumber scraps. The new decking goes down on Oct work day. 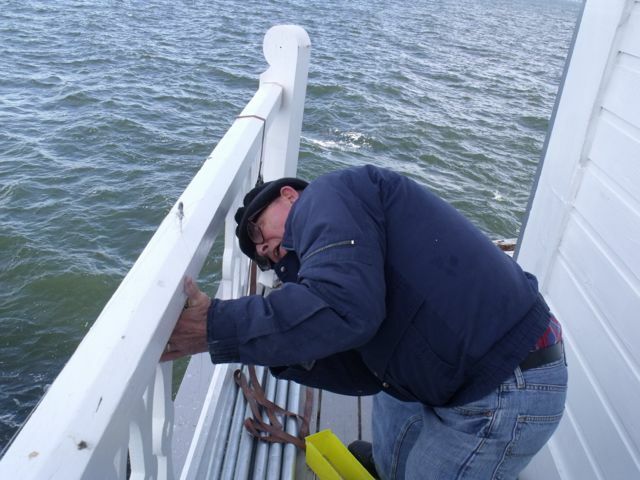 Howard Lewis working on railings. Al Pearson working on deck boards. Howard and Cathy Lewis working on deck. Howard Lewis working on railings where shed used to be. Working on the securing the pickets.